One of our antique beauties was featured here as the Featured Item of the Week. Thank you Jamie from Antique Attic! 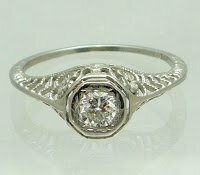 Pictured here is the authentic Art Deco filigree ring.